I'm linking up for the first time with Farley for her August currently. I've used currently prompts in my scrapbook and my family blog and love it so I'm excited for this version. Yes I love Chelsea Handler. She is inappropriate on so many levels but she makes me laugh. Her books have made me laugh out loud. I saw her live last year and was so bummed....thought she would be even more funny in person but not so much. But I still like watching her show from the night before while my girls sleep and I get computer work done. Snappers, people. Go get them now! I'd read about them but couldn't find them at my Costco. I heard they were made in Pittsburgh so when we visited my sister in March I bought the milk chocolate ones. Then a few weeks ago I saw them at our Costco. This time it was the dark chocolate and sea salt version. I'm not normally a dark chocolate person but when paired with pretzels and caramel it is amazing. Addicting, I'm telling you. Had an awesome chat for over an hour yesterday with a friend I used to teach with. I offered to make her some center activities so we were going over where she has holes in the curriculum that she would like to find new activities for. So we planned out some things I could create and then come in and help her implement so I can see my work being used and be around the kiddos again! I love summer. It is going too fast and there is more I wanted to do. Our weather here hasn't been great, so we haven't done as much outside stuff as I would have liked. But regardless I love summer and want it to stay! I don't grocery shop with my kids. I just don't. I can't. I give mad props to the moms who do. It is too much for me. My mom usually watches them or I go once my husband gets home and we put the girls to bed. But we need just a few things so I figured I could just run in with them. That plan failed yesterday because they both had a rough day so I didn't want to be out in public with them. We had big plans to go today after we went to the library but instead went to lunch with friends and both girls were cashed by the time we were done. So we will survive another day with no milk until daddy gets home and mommy can escape. So this will be my 3rd fall not going back to work and that August panic doesn't go away. I still have that feeling that we didn't fit everything in that we wanted to do and I need to get more done and fall is coming soon. And then my husband will look at me and say "why do you care? It doesn't matter. You can still do it in the fall." I know, I know but once a teacher, always a teacher. I still have a minor panic attack when I see school supply sales in July and I still get stressed that summer is almost over. So no it doesn't really impact me since I don't go back to school but I can still sympathize. Plus my teacher friends are going back to work soon so my time to have lunches and plans with them is limited! I have two kids also and it's a little easier now that they are bigger (11 and 7) but there are plenty of times I STILL don't want to drag them shopping, lol! Will have to try snappers, they sound delish! It's funny to hear that the Back to School panic doesn't go away (agh!). I only stayed home with each of my girls for a year, but I think I would feel the same way! 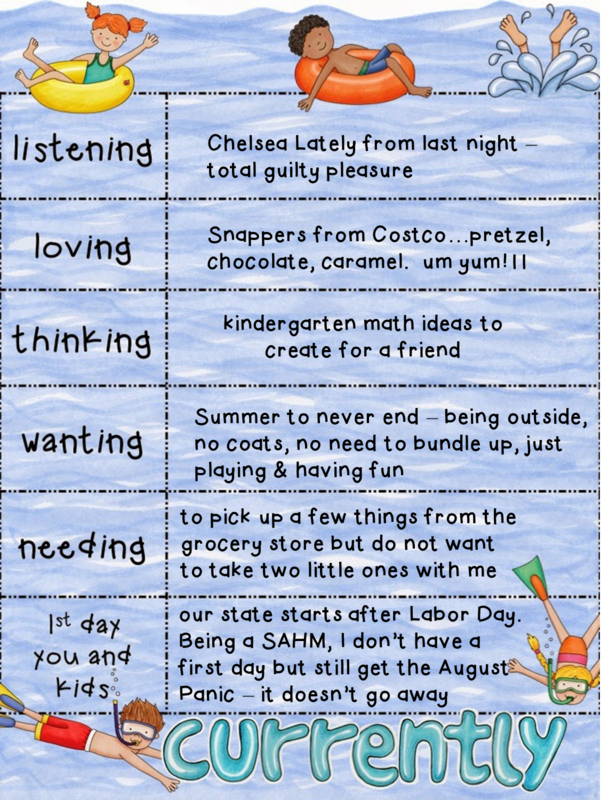 I'm sure things change a lot between summer schedules and fall schedules whether you are teaching or at home. I hope you have a wonderful year with your kids! I don't think teachers ever lose that 'back to school' panic and excitement. I have a friend who is a college professor. She gets just as excited about BTS sales and markers as I do each year.